Comparisons are often made in the music industry. Bands are compared to other bands, both stylistically and performance wise. In some ways, being compared to a legendary band can be a compliment. In other ways, it can be an insult; depending on what the band is trying to craft from their own creative standpoint. Either way, the similarities can turn a fan off or grab the attention of like-minded music lovers. One band which has certainly gained this praise, along with being compared to previous rock legends, is Greta Van Fleet. Hailing from Frankenmuth Michigan, Greta Van Fleet has garnered a collection of awards including 2019’s Grammy nominations for Best New Artist, Best Rock Song “Black Smoke Rising” and Best Rock Album: From the Fires. Since their formation in 2012, Greta Van Fleet has toured extensively throughout their young career. Brothers Jake Kiszka (guitar), Josh Kiszka (vocals), and Sam Kiszka (bass/organ), along with longtime friend, Daniel Wagner (drums) have showcased their live performances in Wisconsin with sold out-shows at the Sylvee, and 2017 JJO Sonic Boom, as well as an upcoming concert this June at Breese Stevens Field in Madison [06/04/2019]. With two previous EPs, Black Smoke Rising and From the Fires, Greta Van Fleet released their first full length album, Anthem of the Peaceful Army in October 2018. The first single, “When the Curtain Falls” sold over 80,000 initial copies and debuted at number three on the Billboard 200. The diversity of Anthem of the Peaceful Army draws from the band’s love of classic rock, as well as their early blues influences. 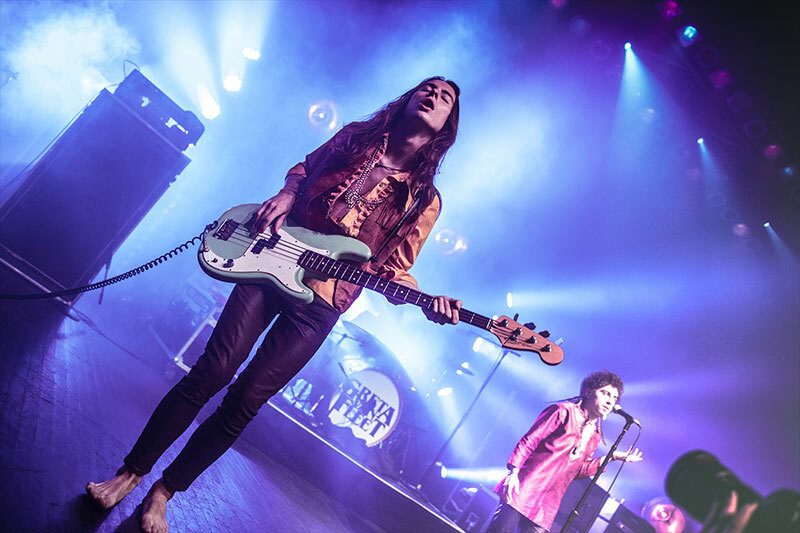 Sam Kiszka (bass/organ) has shared that his favorite bass player is Motown session bassist James Jamerson. Sam has used these influences to help craft 10 unique tracks that break away from the band’s early British comparisons, all the while reaching new levels with their modern texture. Within the collection of songs, “You’re The One”, “Watching Over” and “When The Curtain Falls” allow the band to show both their maturity and their true joy of playing live. Sam shared some of his personal joys of playing Anthem of the Peaceful Army live. “When The Curtain Falls” is one of my favorites because it has a raw-rocking feel and Josh did a great job with the lyrics. And it’s very different from a lot of our other songs. But if I had to pick a favorite, from a composition standpoint and playing live, it would be ‘Watching Over’”. We are ready for what’s next too, Greta Van Fleet, we are too.